Do you love the smell of Lavendar? I do. 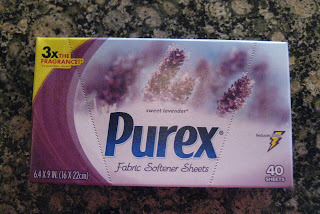 Check out my review on Purex "Lavendar" Fabric Softener Sheets. Purex sent me box of Lavendar Purex Fabric Softener Sheets to review. I absolutely love the Lavendar scent. The box says 3x the Lavendar fragrance and they are not kidding. Before you open the box you can smell Lavendar. I put them in my laundry room and not only does it make your clothing smell super yummy but it leaves your laundry room smelling super fresh every time you open the door. They also work great on static cling since I often forget to put any fabric softener into the washer. Try sticking one in your closets or dresser drawers to keep it smelling super fresh also. You can also put them below your trashbag in your trashcan to help keep the odors down. So what do you do with all those old dryer sheets? Use them again. You can use the same one up to 4 times in the dryer. Use them as Anti-static dust wipes. Clean your TV and computer screens. They repel pet hair and they repel lint. You can use them to remove pet hair and lint from couches and clothing. You can use them to remove soap scum from your bath. Put one in your gym shoes to make them smell better. Use them for dusting your blinds. You can use them on glass. They are great for cleaning windows. Keep some in your car dash for your windshield and to remove all those kid prints.